You're remember'd well, Clive Douglas! 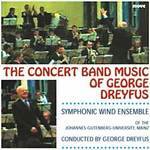 The concert band music of George Dreyfus / Symphonic Wind Ensemble. Portraits : music for brass ensemble. 1 vol. of music (43 p.) ; 30 cm. Instrumentation: Instrumentation varies. 2 trumpets in B flat, trombone (Sea call) ; 4 trombones (Ritual canons) ; 2 trumpets in B flat (Steve Monaghetti) ; trumpet in B flat, 2 horns, trombone (Landmarks) ; 2 trumpets in B flat, trombone, tuba (Arthur Boyd) ; trumpet in B flat, horn, trombone (On the move) ; trumpet in B flat, tuba (Paul Keating) ; 2-200 bass brass instruments (Lincoln takes a breath) ; 3 trombones, bass trombone (Bea Miles) ; 2 trombones (Felix) ; 2 trumpets in B flat, horn, trombone, tuba (Farewell Clive Douglas). 4 Jun 2009: at Sounds of Australia (Visy Theatre).